I'm sure there is a scientific way of actually putting these rollers in and I should probably see if I can find someone on YouTube to teach me, but I do it in a kind of haphazard way and it seems to work for my hair. 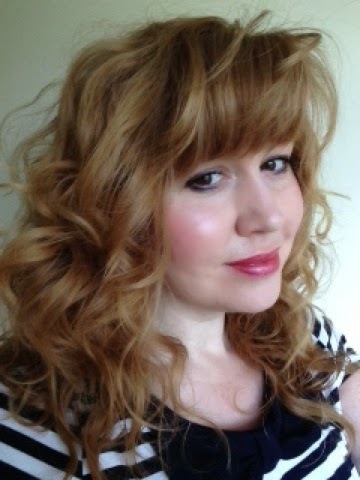 I blow dry it first and put some curl cream in it, or a little bit of beach wave spray before I put the rollers in. It helps my hair if it's slightly damp and I leave them in for fifteen minutes or so. c) I can pop them in really quickly so if I'm in a rush and having one of those mornings where I really need to multi task a lot its perfect, I can whip them out just before I leave the house, grabbing the kids, school bags and PE kits at the same time. I go through phases with rollers, I won't use them for months then I'll use them all the time. It's nice to have a choice of heated or these bendy ones and the curling wand too (though I burn myself a LOT with that I must admit). 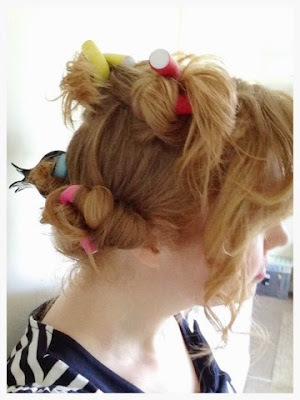 The bendy rollers I use are from Sainsburys for £3.00 and there are 8 in a packet. You can also get them from Tescos and Superdrug. 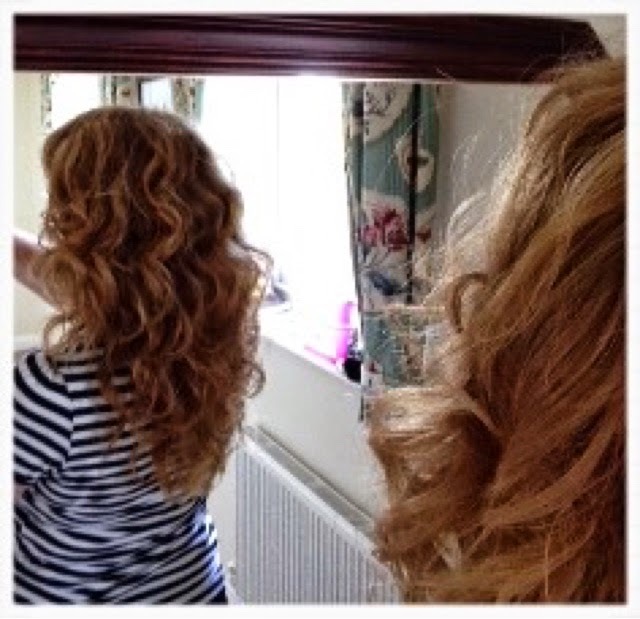 Leo Bancroft the celebrity hair stylist also does some for Sainsbury's they are black and a little bit thicker so the curls are a bit wider (which is nice if you want a change). As they are basically a bit of sponge with a wire in the middle they do tend to poke through after a while and then you have to chuck them away but they are easily replaceable and I don't mind as they are inexpensive. I've also taken them on holiday and used them on damp hair and let it dry. They aren't heavy or cumbersome so good for travel. The EcoTool brushes are a recent addition to my make up brush collection (which has grown considerably since I realised I hadn't bought any new ones for years). They are made by EcoTools and the ones pictured are a mixture of the Fresh & Flawless Complexion Brush Set (£11.99 for a set of 5 brushes) and the EcoTools Duo Eye Enhancing Set blending and shading brushes (£6.99 for two brushes, double ended). 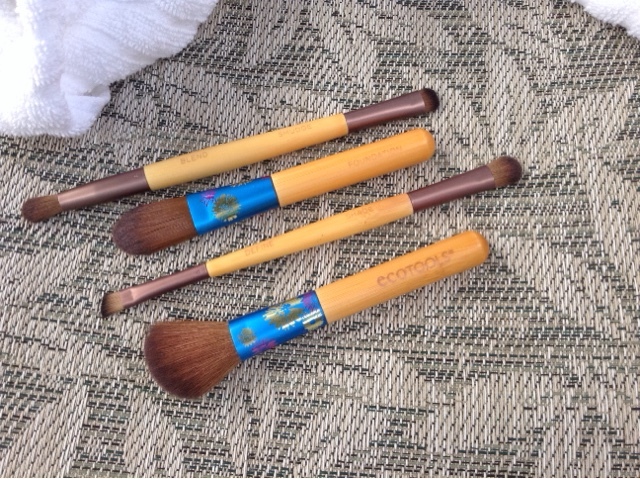 The brushes are made of natural materials and they are very soft and glide effortlessly across your eyes and face, the handles are made of bamboo so are very light. I bought these in Superdrug and must admit to taking ages to choose as there were several options, the range is fairly extensive and they are extremely good value as they are lovely brushes and well priced. I've just checked the Superdrug.com website and they are all on there if you want to go and have a look. I took the Fresh & Flawless Complexion Brush Set on holiday (hence the photo of them on the sunbed) as they were in a very handy case that I just put in my bag. When I got home they went straight in my brush pot alongside my new Real Techniques brushes (another brand I'm currently obsessed with!). I washed them gently in Baby Shampoo and flat dried them over a towel on the radiator overnight and they were good as new in the morning.